December 19, 2016 by Beeraj Patel, Esq. Are you seeking a temporary (nonimmigrant) visa or seeking to become a permanent legal resident (immigrant)? Is the basis for the visa petition family-based or business-based? Which sub-category of family-based or business-based visas is appropriate? How do I commence the visa process? You may decide to conduct your own research on your U.S. visa options and how the classification will impact the application process and timeline. Or, you may opt to save time and increase confidence in the information you find by consulting and experienced immigration attorney. Although the person who is seeking to enter the United States is often referred to as the “applicant,” many types of visa applications must be filed by third parties. For example, when someone wishes to enter the U.S. based on a familial relationship with a U.S. citizen, it is the citizen who must petition for a visa for his or her family member. Similarly, petitions for most types of work visas are submitted by the employer or prospective employer, not by the would-be-immigrant employee. 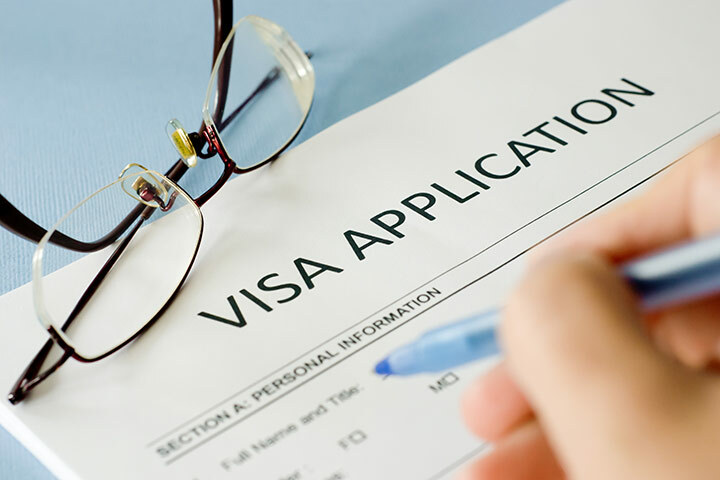 However, in certain visa categories, the applicant himself or herself submits the petition. One common example is a foreign national seeking an investor visa. If you are a U.S. citizen seeking to bring a family member to the United States or an employer working toward hiring a non-citizen, our experienced immigration attorneys can help you determine the next steps and guide you through the visa application process. The actual visa application process differs in ways beyond the person responsible for filing the petition. There may be preliminary steps required in some regions. For example, those hoping to emigrate to the United States from India are required to undergo a police investigation and medical examination before appearing at the Embassy or Consulate for the initial interview. Thus, it is very important to thoroughly investigate the specific requirements associated with the relevant visa category and the local requirements before beginning the visa application process. The first step for an employer petitioning for a work visa on behalf of a prospective employee or employee of a foreign division is to determine whether a Labor Condition Application (LCA) must be submitted to the Department of Labor (DOL). LCAs are required primarily in HB1 visa cases but are also the first step in E3 cases involving Australian citizens in specialty occupations. If an LCA is required, that filing is the first step. If the DOL certifies the LCA, the employer may then submit the visa petition. Which form is used to commence the visa application process depends on whether the applicant is seeking a temporary work visa (nonimmigrant visa) or permanent legal residence (immigrant visa). The first step toward a family-based immigrant visa is the same regardless of whether the applicant is already in the United States on a temporary visa or is a new applicant outside the U.S.: filing of the immigration petition. However, the subsequent steps will vary: an applicant in the United States on a temporary visa will follow an Adjustment of Status process, whereas a person currently residing outside the U.S. and not holding a current visa must begin with the local Consular. The information above covers only a portion of the visa petition process, and only with regard to certain types of visas. The groundwork required, eligibility analysis, documentation that must be submitted and even the process itself vary dependent on the type of visa desired, the country of origin, the basis for the visa and other factors. In the visa application process, there is too much at stake to simply fill out a form and hope for the best. The experienced attorneys in our firm are ready to assist you from beginning to end, reducing your stress and insuring that the process is not derailed by easily avoidable mistakes.